It's time for a little quick fix, and one that is fitting to the end of the summer season. Watermelons everywhere are having their last hurray and this is the perfect way of celebrating with them. I don't know what it is this summer, but it's like I was bitten by a bleu cheese spider or something. I have been putting it on everything. I came up with this little gem of a recipe when my plan to make deviled eggs went south. We had all these eggs in the fridge and my friend wanted to buy them, and I told my husband "just don't sell the house carton because I want to make deviled eggs tonight." What do you think he did? Yup, he sold the house carton. Sheesh. Husbands. So, I had to get creative. And I had a watermelon, so it worked out just fine....honestly, this was less work, so I'm not really complaining. 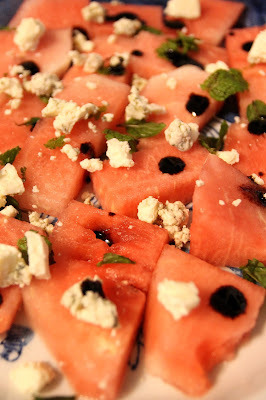 I cut some melon, took the seeds out, picked a couple of mint leaves from my now very pathetic looking mint plant, threw some bleu cheese on it and then dabbled it with some balsamic reduction. Easy right? I know!! When my friends came over for dinner, my one friend who isn't even that into watermelon liked it because the watermelon was more savory than sweet. So ladies and gentlemen, start your watermelons. The season is almost over and this is one awesome little appetizer to savor before the official end of summer!!!! Cut the melon into pieces. If I had been feeling more crafty that day, I probably would have broken out a cute little round cutter and made them extra pretty. This is entirely up to you. Heck, use a melon baller, I don't care. Get fancy. Put your melon on a platter in a single layer. Top with the mint and bleu cheese. Dabble on your balsamic reduction. (I buy the ready made stuff because it's delicious and comes with truffle in it.) I like to put one dab per piece of melon. Serve with toothpicks or just dig in with your hands--depending on your company and level of comfort on the subject of eating with your hands.